Stage two of the Vuelta a Andalucia continued today for what was to be a decisive stage for the General Classification. The weather continued to cooperate with low winds, sunshine and warm temperatures. 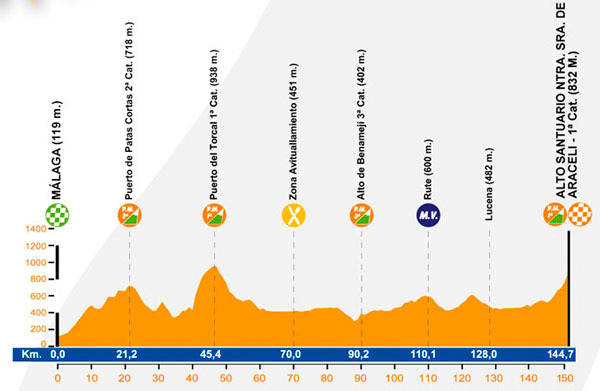 With climbing as the main feature of this 144km race between Malaga and Lucena, the team was led by newly-hired Directeur sportif Michael Carter, a former professional climber. The stage unfolded as everyone had expected. The peloton was very active with riders from each of the 18 teams wanting a place in the opening break, and as a result the break was difficult to accomplish. Team SpiderTech protected their two climbers, Caleb Fairly and Lucas Euser, in order to best position them for the climb and put them in the best possible General Classification positioning. Ultimately, it was Lucas Euser who climbed his way to the top SpiderTech rider, taking the 18th spot at the topthe tough race as he crossed the finish line just 32 seconds after the stage winner and new race leader Alejandro Valverde of UCI World squad Movistar Team. The team also had as an objective to protect Will Routley’s position in the Meta Volantes Classification. Routley, who stepped on the podium in yesterday’s race, is currently sitting in fourth place of the Meta Volantes classification, with two points. 4 Frank Schleck (Lux) Radioshack-Nissan both s.t. 8 Adrián Palomares (Esp) Andalucia s.t. 12 Eduard Vorganov (Rus) Katusha Team both s.t. 16 Haimar Zubeldia (Esp) Radioshack-Nissan both s.t. 22 Matthias Brandle (Aut) Team Netapp all s.t. 31 Beñat Intxausti (Esp) Movistar Team all s.t. 34 Juan Manuel Garate (Esp) Rabobank Cycling Team s.t. 38 Yury Trofimov (Rus) Katusha Team both s.t. 44 Tristan Valentin (Fra) Cofidis, le credit en ligne all s.t. 49 Juan José Oroz (Esp) Euskaltel - Euskadi s.t. 51 Thomas Degand (Bel) Accent Jobs - Willems Verandas s.t. 59 Javier Ramírez (Esp) Andalucia s.t. 62 Pim Ligthart (Ned) Vacansoleil-DCM Pro Cycling Team s.t. 67 Kevin Van Melsen (Bel) Accent Jobs - Willems Verandas both s.t. 74 Markel Irizar (Esp) Radioshack-Nissan both s.t. 76 Javier Aramendia (Esp) Caja Rural s.t. 82 Jesús Rosendo (Esp) Andalucia both s.t. 84 Mickaël Buffaz (Fra) Cofidis, le credit en ligne s.t. 87 Michael Matthews (Aus) Rabobank Cycling Team s.t. 91 Ryan Anderson (Can) Spidertech powered by C10 both s.t. 99 Will Routley (Can) Spidertech powered by C10 all s.t. 101 Patrick Gretsch (Ger) Project 1T4I s.t. 108 Manuel Cardoso (Por) Caja Rural s.t. 12 Maxime Monfort (Bel) Radioshack-Nissan s.t. 14 Robert Gesink (Ned) Rabobank Cycling Team s.t. 16 Bauke Mollema (Ned) Rabobank Cycling Team s.t. 23 Siron Spilak (Slo) Katusha Team s.t. 27 Leopold Konig (Cze) Team Netapp s.t. 42 Johahnes Frohlinger (Ger) Project 1T4I s.t. 71 Gustavo Cesar (Esp) Andalucia s.t. 76 Gregory Habeaux (Bel) Accent Jobs - Willems Verandas s.t. 95 Patrick Gretsch (Ger) Project 1T4I s.t. 98 Will Routley (Can) Spidertech powered by C10 s.t.